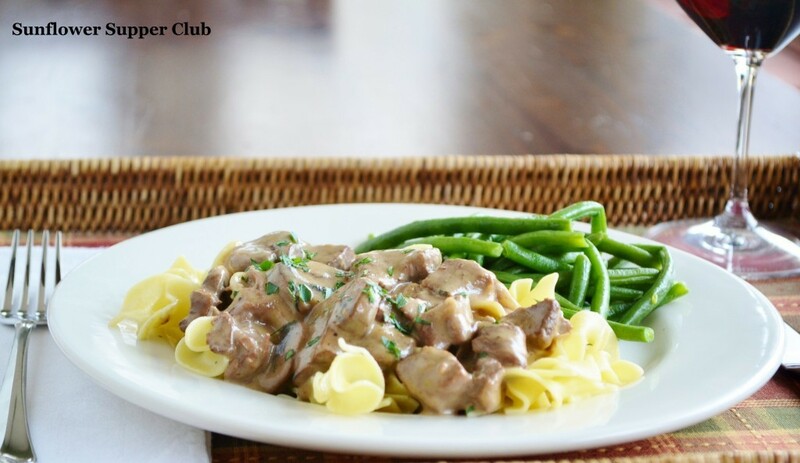 I have always loved the flavors in Beef Stroganoff, and it’s a great family dinner that is also special enough for company. Typically, I serve it over buttered egg noodles, but it is also great over rice. Some recipes for Beef Stroganoff don’t call for browning the meat. Trust me, it is an important flavor step and well worth it. After you brown the meat and saute your veggies, you should de-glaze the pan with red wine and get all those yummy brown bits that have stuck to the bottom of you pot. I know this is extra work, but it will pay off in the flavor of your dish, I promise! 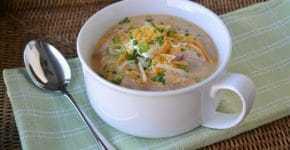 My original recipe is a slow-cooker one, but I adapted it for the oven. After you brown the meat, you could certainly throw everything in the slow cooker on low for several hours. The slow-cooker recipe instructions suggest that when you add the flour and water mixture, just turn the heat to high for 30 minutes to thicken. I have not had good luck with this, so I prefer to cook it in the oven. I’m sure Dan would love to tell you the story of when we were newly married and we had Beef Stroganoff paste over noodles because I couldn’t get the dish to thicken. I just kept adding more flour to the slow cooker. Hey, that seemed to me to be the logical cooking thing to do! You see, that is why I prefer the oven for this particular recipe — bad memories — but I think the slow cooker would work as well. I must be challenged that way! If you do use your slow cooker, I’d love to know how it turns out for you. Heat the vegetable oil in a Dutch Oven over medium-high heat. Brown the meat in 2 batches until it is browned; remove with a slotted spoon and place on a plate. Reduce heat to medium and melt 2 tablespoons butter in the Dutch Oven. Add the mushrooms, onion, garlic and thyme; Sauté for 10 minutes. Add the red wine to the Dutch Oven to deglaze the pan. Simmer for about 3 minutes until the wine has almost evaporated. Add the beef broth to the pot and return the browned meat and any accumulated juices. Cover the Dutch Oven and place in a 325 degree oven for 2 hours. After 2 hours check the beef for tenderness. Place back in the oven for 30 more minutes if it is not tender. In a glass jar with a lid, combine the flour and water, shake vigorously to combine. Pour the mixture into the Dutch Oven and stir; cover the pot and return to the oven for 15 minutes to allow the Stroganoff to thicken slightly. Meanwhile, cook pasta in boiling salted water, drain and coat with the remaining 2 tablespoons of butter. Remove the meat from the oven, stir in the Dijon mustard and the heavy cream. Let stand for a few minutes to thicken. Divide noodles on plates and top with beef mixture. Garnish with fresh parsley if desired.